Amazon’s Kindle Fire has 54 percent of the Android tablet market. (The Barnes and Noble “Nook” is considered an e-Reader, rather than a tablet.) 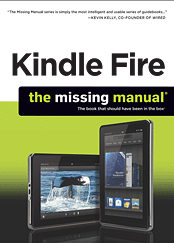 With that in mind, we thought it a good idea to take a look at “Kindle Fire: the Missing Manual,” by Peter Meyers; $20 from MissingManuals.com. You may already know how to watch TV and movies on your Kindle, listen to audio books, play games, send email and read magazines and books. But if you don’t, this is your guide. And there are some extra tricks even experienced users may not know. You can put your own video on the Fire by emailing it to yourself, for example. And the book has a good guide to the best apps for the Fire, in categories like music, cooking, travel, business and art.